Memorial Park opened in the 1920's. Holly Keris serves as secretary of the Memorial Park Association board. Her group believes Memorial Park to be the premier park in the city but it is showing it's age. There are holes in the fencing along the front of the park, the four entry walls are chipped and painting of the perimeter walls is needed. The open yard floods often and drainage work is needed. The $400,000 the group now has will go a long way towards renovations. 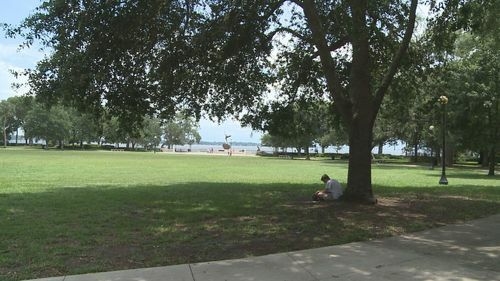 "This park is really a neighborhood treasure not for this particular neighborhood but for the whole city of Jacksonville," said Keris. "And the fact we now have some support from the City Council to do the restoration work we need is really tremendous. " Major repairs will be made to the Life statue and fountain, which now is often filled with trash. 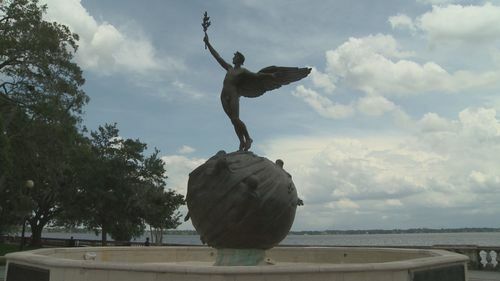 The statue was dedicated in 1924 to the memory of 12-hundred-twenty Floridians who gave their lives in World War One. Their names are in parchment in a box underneath the art work. "It hasn't been treated and maintained with the respect it deserves," said Keris. "As both a memorial as well as an important piece of art. The fountain component themselves are not functioning , the drainage components aren't working, the sculpture itself has deterioration and actually has some holes in places. As the centerpiece of this park, a lot of the investment dollars are going towards making that a beautiful functional memorial." The Memorial Park Association will oversee the repairs. The group does not yet know when the work will be started or when it will be finished, but the group is looking forward to it being finished.